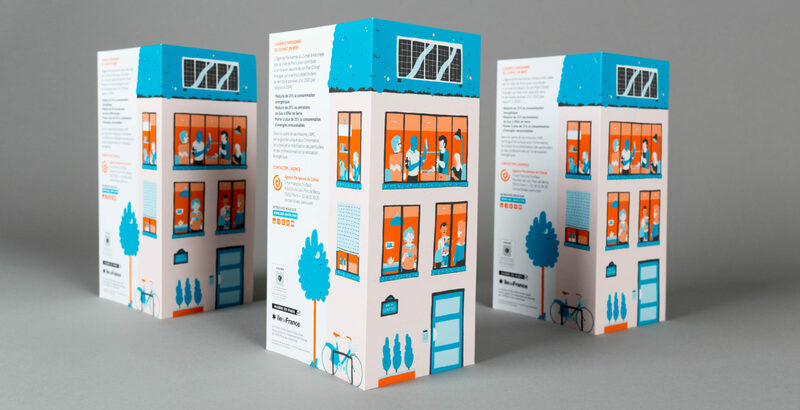 This leaflet has been designed for the Paris Climate Agency (APC) to promote energy saving. It takes the form of a building and can stand as a real one (yes, a tiny one). The illustration on the cover presents individual and collective actions for energy transition. To make the leaflet original in its treatment and to design an object in coherence with APC issues, we proposed to use only two colors extracted from their graphic charter and to design the entire document with the palette of shades resulting from their mixing. The Parisian climate agency wanted to produce a brochure presenting its services. More concretely, the services concerning energy savings in housing should be: free and independent advice for Parisians, the provision of tools and devices such as the CoachCopro®, the Positive Energy Families Challenge, meetings to exchange and train... etc. A first brochure was produced when the Agency was created in 2011. This year, the APC wanted to publish a new brochure based on the new graphic charter and including our new messages and projects. It had to be attractive, fun and adapted to the general public. A reader without knowledge of energy saving should be attracted to this leaflet and should be able to understand the content easily. The objective of this brochure is to make the reader understand that saving energy is important from different points of view (economic, ecological, comfort...) and to make him want to act on the different positions within the housing and building. energy bills, improvement of living comfort, reduction of environmental impact and, in the case of renovation, enhancement of the heritage. In the end, energy savings can be fun and user-friendly, particularly through the measures proposed by the APC such as the Positive Energy Families Challenge or the various meetings and events organised by the Agency. Publishing design, creation of magazine and brochure layouts. Creation of illustrations. Communication for non-profit and NGO. Communication in ecology & environment.